The first publication from the Low Family in over 100 years has arrived in our offices! We’re delighted to be working with the artist’s group CollectConnect who exhibit in unusual places all over the world. FreedBook is a 72 page softback book, containing 68 one-page stories from 50+ artists. There were 100 copies printed in the First Edition. alban.low@sampsonlow.com so see if still have copies of the 2nd pressing. 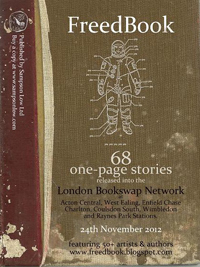 The FreedBook was launched in November 2012 in partnership with the Books For London network of libraries on London’s Rail Network.